While the International Space Station was traveling over the Mediterranean Sea, Expedition 42 Commander Barry “Butch” Wilmore of NASA, with the assistance of Flight Engineer Samantha Cristoforetti of the European Space Agency, successfully captured the SpaceX Dragon spacecraft with the station’s robotic arm at 5:54 a.m. EST. 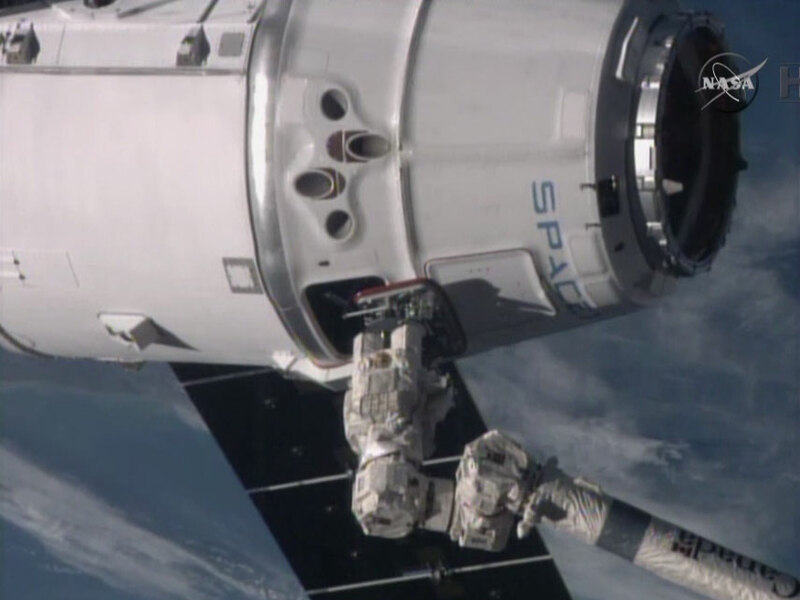 NASA TV coverage of operations to berth Dragon to the space station will begin at 7:45 a.m.
I’m glad the crew are safe. Do they sometimes feel like they have helium in the top of their head? I felt like that today, Chris Hadfield has my photos. It was 12 months since the nasa hand if god photo, 10th Jan 2014 and on 11th Jan 2015 something happened again, upwards, my hands started fizzing. I dont know if you’ve seen the coloured light footage. Chris Hadfield was busy at the book shop linked signing in urmston, so even though I took my laptop to show him, I didn’t get to. They followed me from Alderley Edge and even to a camp sight above the tree area. But they link to orion. It makes me get blue and red lights in my forehead area which fade to black and white squares. Plus I got really strong and from kneeling up, could pick up both my children on my back. Ive also been fed from someone else, withoutbeing near them. Its amazing, but frightening. I got oxygenated today and felt awful, got a freezing right foot and gad to sleep to get through it. When my sons got to my mums u felt like I coukdnt breath. Apx 3pm.greenwich mean time. I had to tell them to open the window. Rose quartz connects the world. Egyptians understood.